A France squad containing Samuel Umtiti and Ousmane Dembélé are World Cup winners following their 4-2 win over Ivan Rakitic’s Croatia side in the final played in Moscow. An own goal from Mandzukic, a penalty from Griezmann and strikes from Pogba and Mbappé were enough to see off the Balkan team for whom Mandzukic and Perisic found the net. France claim their second World Cup title some twenty years after their first which was won on home soil. Croatia started the better of the two teams but found themselves behind against the run of play on 19 minutes. Griezmann floated a free kick into the penalty area and Mandzukic could only flick the ball on into the top corner of his own net. Nevertheless, Dalic’s team were quickly on level terms. Perisic fired in from the edge of the box to make it 1-1 still in the first half. On 38 minutes the Inter Milan midfielder went from hero to villain when after the referee used VAR for the very first time in a World Cup final to adjudge a handball by Perisic in the area. Griezmann fired home the penalty to give France a 2-1 lead at half time. The second half began much as the first had with Croatia on the attack. However, it was France who struck with Pogba firing home from inside the area after a quick counter. An excellent strike from distance from Mbappé appeared to end the game as a contest with France 4-1 ahead only for France goalkeeper Lloris to be caught out by an alert Mandzukic who pulled one back for Croatia with just over 20 minutes left. The miraculous comeback never materialised and France claimed their second World Cup title after victory in 1998 on home soil. 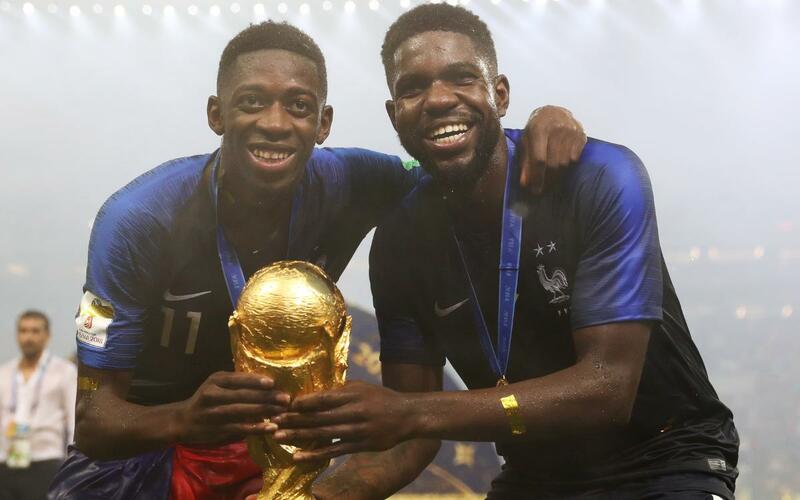 Blaugranes Samuel Umtiti and Ousmane Dembélé can now add the World Cup title to a season in which the two FC Barcelona players had already added the La Liga and Copa del Rey titles to their list of honours.